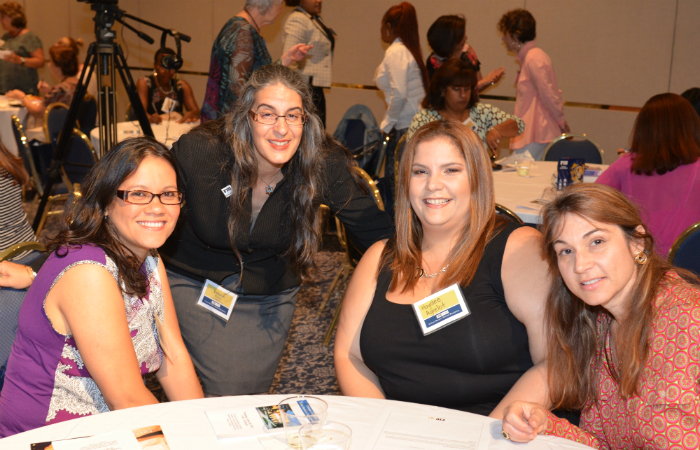 Associate Dean Deborah Hasson (second from left) reconnects with Urban Education Master’s alumni Yoelsys Betancourt, Haydee Agrelot and Lisa Hunt (left to right). What drove some 60 teachers, administrators and principals to brave brutal rush-hour traffic heading toward the Modesto A. Maidique Campus recently? It was the chance to reconnect with professors, old friends and colleagues who graduated from the College of Education’s Urban Education Master’s Program. Cynthia Clay, who graduated from the Master of Urban Education program in 2000, is now principal of Robert B. Ingram Elementary in Opa-Locka. 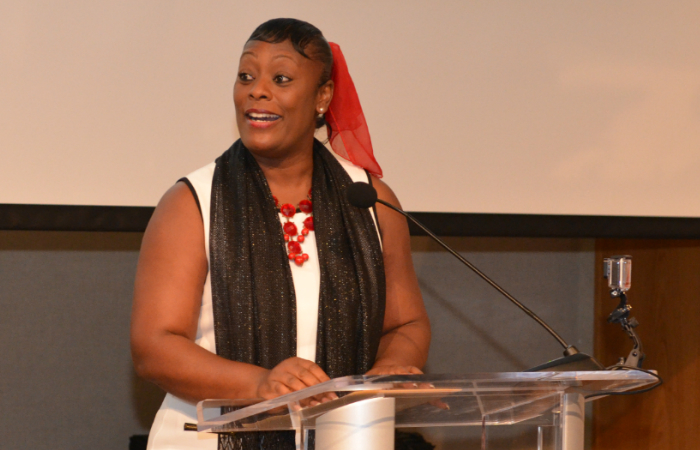 “It helped me to be a better teacher, a better reading coach and a better leader,” said Cynthia Clay, who graduated in 2000 and went from teaching the second grade to being principal of Robert B. Ingram Elementary in Opa-Locka. Since 1997, the College of Education has funded 11 cohorts of more than 220 Miami-Dade County Public Schools (MDCPS) educators to earn a Master of Science in Urban Education, which helps them work specifically with children who grew up in and attended schools in Miami’s urban core, many of whom were not native English speakers. Delia C. Garcia, dean of the College of Education, addresses her former students at the Master’s of Urban Education reunion. 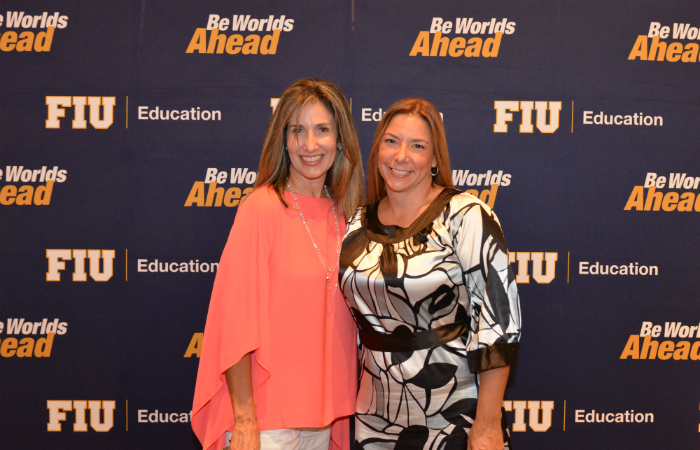 Clay and her peers credit the innovative nature of the program – created through a partnership with MDCPS and the United Teachers of Dade – with helping them make immediate changes to their teaching that benefitted the students they served. At a nearby table, Rose Blot reconnected with classmates from her 2003 cohort, Kamila Lillie-Johnson and Rosena Wright. 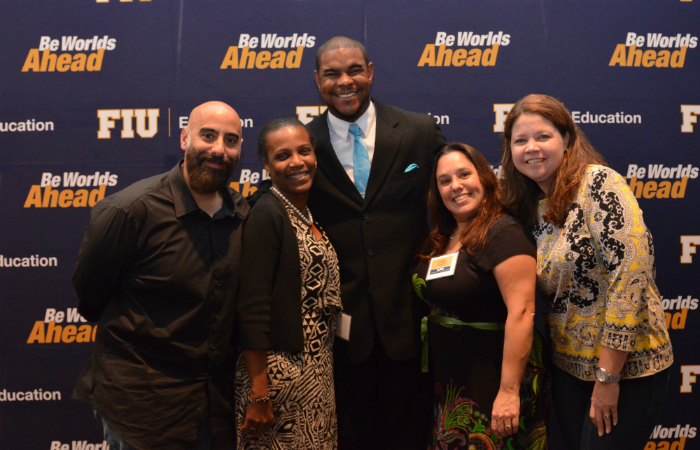 Paul V. Wilson (center) poses for a picture with members of his Urban Education cohort. Paul V. Wilson, who serves today as administrative director of school operations for MDCPS, used the skills he learned in the program to connect with and influence children in Miami-Dade’s Juvenile Justice Center. “I was teaching urban young men who gave up on the power of education and what it could do for them,” Wilson recalled. “They took an interest in the stuff I was trying to teach them because I used a lot of hip hop and a lot of music to get messages across. “I put multiplication tables to a beat and the kids remembered them because I put a beat in their head,” he added. At first, however, Wilson was skeptical about whether the program could actually make a difference for students who grew up in impoverished neighborhoods or who lacked positive role models. 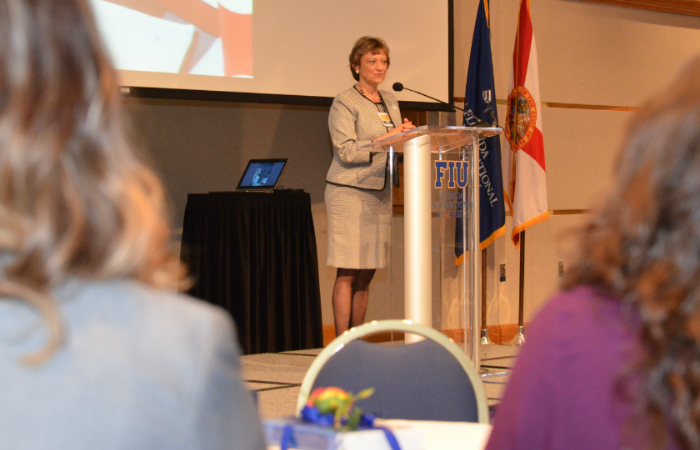 Pilar Baldwin, who is MDCPS’s district supervisor for the office of early childhood programs, said what she learned in the program is even more crucial as the school district continues to evolve and grow. She learned the importance of culturally responsive practices and recognized that students faced many challenges including having to learn English. Michelle Garcia-Sabbag and Judith Melendez became fast friends during their time in the Master of Urban Education program. Sitting next to Baldwin was elementary school teacher Michelle Garcia-Sabbag and her best friend, Judith Melendez, assistant principal of George W. Carver Elementary School. Garcia-Sabbag and Melendez met in the very first cohort of students to go through the program and they became inseparable.